The #MyOreoCreation Contest asks fans to submit their taste creations via social media for the chance to see their cookie hit shelves nationwide. Oreo joins the likes of Lay’s Potato Chips and Quaker Oats this week by inviting consumers to dream up its newest flavor in a social media contest. Although the brand regularly introduces limited edition flavors like Brownie Batter and Banana Split Crème, this marks the first time Oreo has solicited ideas from the public. "Of course we’re aware of what other brands have done," Oreo Brand Manager Madeline Vincent said. "But for us, it was really about that insight that fans are already sharing flavors all the time, and we said, ‘How can we take this natural behavior and turn it into something really cool and engaging?’"
To kick off the contest, Oreo released a 30-second digital spot starring actress Ellie Kemper from its social agency 360i as well as Instagram posts from celebrities like Tituss Burgess and Katie Lowes, encouraging fans to submit photos, videos or text via Instagram or Twitter using #MyOreoCreation #Contest. When they do, 360i will be listening. "We’re going to engage with a lot of people in a super playful way," Vincent said, one being personalized gifs sent to consumers via social media that illustrate their suggestions. Oreo will then select three finalists, each receiving $25,000 and the thrill of seeing their cookie on grocers’ shelves in May 2018. 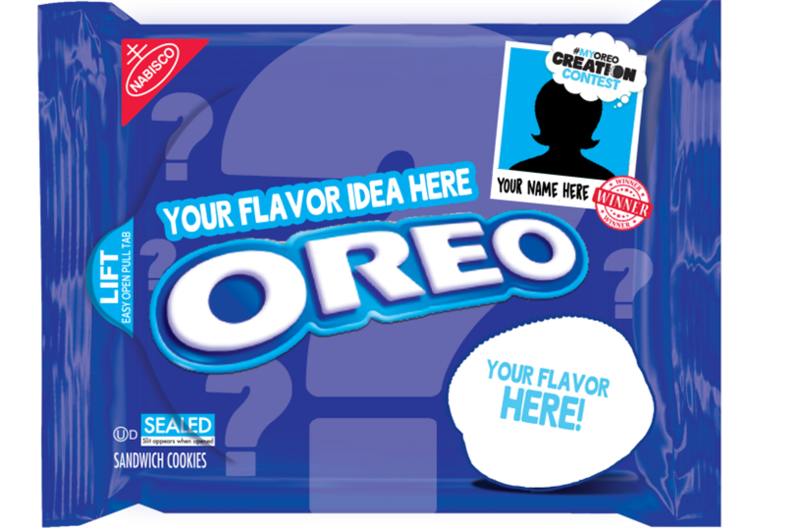 The grand prizes include $500,000 and the chance to go inside the Oreo Wonder Vault, where various flavors are made. The campaign, Vincent said, continues the brand’s playful "Wonderfilled messaging," with an eye on raising awareness of existing options. "If you look at our company as a whole, we’re concentrating on household penetration," she said. "That is a true business objective, to make sure that more people know about our flavors and our chocolate candy bar and the great things we’re doing." But it’s also about keeping a 105-year-old Oreo modern while remaining true to its past. "It’s not about reinventing the brand," Vincent said. "It’s continuing to evolve and push ourselves, so I think our flavor strategy and this campaign are examples of ways we’re engaging playfully with our fans to keep ourselves super relevant." Mondelez reported its Q1 sales last week, beating analysts’ earnings and revenue predictions but still falling 0.6 percent year over year. The decline has been attributed to consumer shifts away from packaged foods and toward healthier options. As the company struggles to find its footing, it’s shaking up its corporate ranks, recently parting ways with CMO Dana Anderson, VP of Global Media and Digital Bob Rupczynski and President of Mondelez North America Roberto Marques. Even Chairman-CEO Irene Rosenfeld is rumored to be on the outs, according to the Wall Street Journal. While Oreo enthusiasts can suggest any flavor, consumers needn’t fear ill-tasting concoctions (like, say, toothpaste and orange juice). "It is a contest, rather than a sweepstakes," Vincent clarified, which gives Mondelez control over which entries make it to market. "We would only ever release a flavor that would be delicious, and that’s why taste appeal is one of our judging criteria." Also with this announcement comes a new flavor: Firework. It’s Oreo’s original crème mixed with red and blue "popping candy," which is somewhat akin to Pop Rocks. "In the past, we’ve always tried to capture a flavor in an Oreo cookie. Now we’re trying to capture an experience," Vincent said. "It really does evoke that very nostalgic feeling of watching a fireworks show in the summer."